Description: Come home to a spacious one bedroom, one bath luxury apartment in Leander, TX which features a spacious pantry and large kitchen, only at Merritt Legacy. Description: Enjoy the beautiful Leander, TX sunrise or sunset from the private patio of this spacious two bedroom, one bath apartment home. Description: This split floor plan, two bedroom, two bath Leander, TX luxury apartment offers superior interior details like faux wood flooring in the kitchen and living room, and Energy Star appliances. 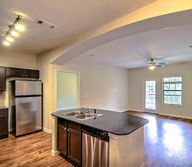 Description: Two Bedroom; Two Bathroom; Den - With a den off the master suite, this spacious two bedroom, two bath, pet-friendly Leander, TX apartment offers 1200 sq. ft. of living space. Description: An open concept kitchen and living room with full-size washer and dryer connections makes calling this three bedroom, two bath luxury Leander, TX apartment your new home simple. Description: Merritt Legacy is proud to offer one of the largest three bedroom floor plans in Leander, TX, which was designed with you and your family in mind.